Have you ever noticed how much better you feel living or working in an organized space? When you’ve got your life put together, it feels way easier to focus and get things done. Well, there’s a reason you feel that way: there’s a lot of scientific evidence demonstrating how organization has a huge, positive effect on our mental health. A 2013 survey found that one of the most common stressors for American homeowners was disorganization in their homes. A 2009 study found an association with disorganization and “the stress hormone” cortisol. People who described their homes as messy were more stressed and depressed, with flatter cortisol slopes, than people who described their homes as tidy. It’s easy to understand why. When your home or workspace is cleaned up and organized, you just feel a lot more on top of whatever you’re doing. When you’re surrounded by unfinished projects and work that you haven’t done, it’s easy to feel overwhelmed and stressed out. Before you start a work day, consider cleaning up your space a little bit. You might be surprised how much better you feel. In 2011, the Princeton University Neuroscience Institute published a study demonstrating how cluttered environments negatively affect the brain’s ability to focus and process information. Even if you’re not interested in it, your brain automatically takes inventory of the stuff around you. Meanwhile, the processing power it’s using to do that can’t be used to focus. It’s like putting time and energy into a project you don’t want done in the first place. You have less energy to devote to what you want to focus on, and you’re not getting anything back for the extra trouble! If you’re trying to focus in a tidy room, you won’t have to compete with your brain for mental processing power. You can devote your whole attention to the task at hand. If you find you have trouble focusing at work, you and your brain might not be on the same page. Try clearing your desk! You might find out that’s all you need to get focused. A 2013 study from the Association for Psychological Science found that, among other things, tidy environments tend to make people choose to eat healthier snacks. A study published in the 2011 Journal of Obesity found that people with an organized routine were more likely to stick with weight-loss exercise programs than disorganized people. Again, in both cases, the connection is easy to see. When your life is organized, it’s easy to stay on top of your goals. Whether you want to eat healthier or exercise more, it’s easier to make the commitment when you don’t feel bogged down by other projects or concerns hanging over your head. 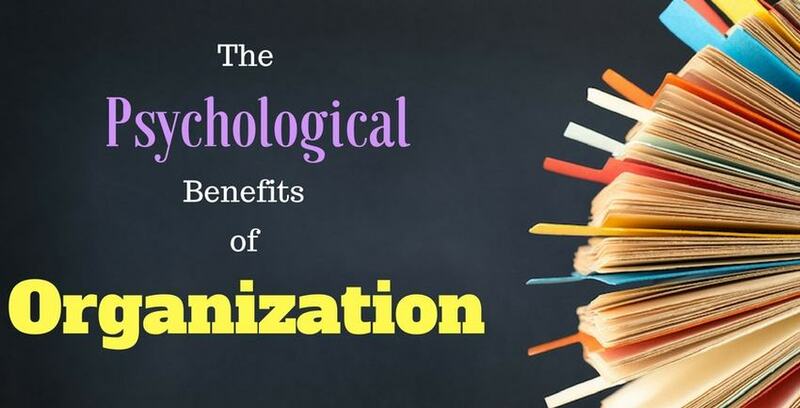 Organizational benefits aren’t just restricted to healthy lifestyle goals, either. Whatever your goal, making a plan and getting organized is one of the best ways to go about achieving it. According to a survey conducted by the National Sleep Foundation, 75% of people noted that sleeping in a clean, tidy room with fresh sheets and a made bed improved their sleep. In addition, the effects of stress on sleep quality are well-documented. It’s hard to sleep when you’re stressed out, and disorganization is stressful. If you go to bed thinking about how much you have to do, you might waste time worrying when you could be getting a good night’s sleep. One of the best things you can do to help yourself sleep at night is to simply make a list of what you want to accomplish the next day. If you get organization and make a plan, you won’t have to worry about what you should or shouldn’t be doing, and you’ll find it’s a lot easier to fall asleep. It’s easy to neglect, but organization should be an important part of self-care. Taking a moment to clean up or assess how you’re doing and feeling is never a waste of time; in fact, as we’ve shown, it can make a huge difference! If you need some help getting organized, or you just need a little extra space, give one of Storage Direct’s units a try. Putting extra clutter in a dedicated place is a first step towards getting organized, and as you can see, getting organized is a great first step towards living a healthier life. Start today!